This painting is the visible apex of a multifaceted creative adventure. I painted it at a time my gardens were undergoing rapid expansion, particularly with thousands of my favorite poppies, those amazing Shirley poppies. These gardening projects were propelled by the energy processes I use on a daily basis. Both Reiki and the Perelandra nature processes provided the primary energies in that phase of my garden development. My paintings were also infused with Reiki, often spontaneously, while I was working at the easel. I, as many artists do, often feel that my paintings have their own source, an origin other than me. As an interesting experiment, I began to deliberately bring Reiki into the paintings after I found it unexpectedly occurring. When the paintings were completed, I saw that some of them were still radiating that energy without further input from me. I had not anticipated such a result, so I watched in the gallery to see how people would respond. The obvious first question was whether it was something only I would notice about the work. Center of the Sun provided dramatic answers to that question. I leaned it against the taboret temporarily prior to rehanging the gallery. The light on it was poor in that location but I was concentrating on another painting I was trying to finish. Within the same week two different women who did not know each other walked into the gallery on different days. Each was casually browsing until arriving in the middle part of the gallery where I had the Center of the Sun leaned against the taboret. In both cases, the woman noticed the Center of the Sun, paused, and then started looking at the painting with more intensity. Both began sobbing. Somewhat in shock, I listened to each lady tearfully tell me of their hearts opening, remembering beauty and passion in their lives. They were utterly overwhelmed by their feelings. I was quite unprepared for those responses. In fact, I went and bought more Kleenex for the gallery. Neither of the women bought the painting, but each went on her way deeply moved. I continued to observe what happened with the painting. People continued to respond to it, but not in such extreme fashion as the first two ladies. Then the painting was chosen for a winter show at the Yellowstone Art Museum. I am happy to say Center of the Sun did find a home with someone who loved the painting. Note about Lexi Sundell’s painting: “Center of the Sun” is acrylic on canvas 60″ wide by 46″ high. Other original paintings and prints available at RiverStone Gallery. Note: This post is now featured on the New Blog Carnival. Have a look to find some other new and interesting blogs! This post also appears in the Arts & Stuff Carnival, which has an interesting collection of creative articles. 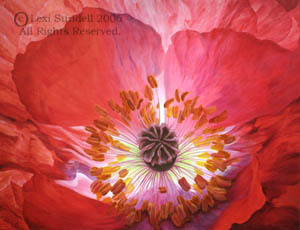 This entry was posted in Art Paintings, Gardening for Art on March 27, 2007 by Lexi Sundell. What a wonderful response to have from a painting. Maybe the energy ‘wore’ off after it had touched those two woman ;). I am not convinced the energy “wore off” because as I paint I do use the intention that the painting bring whatever healing it is supposed to bring to whoever is supposed to receive it. I never know what that is, but once in awhile, such as with this painting, I get a glimpse of the process in action. The hard thing about the internet is you lose all sense of scale. That painting 60 inches wide is a totally different experience than 6 inches wide on a screen. Glad you liked it in the 6 inch version! Thank you so much! It a remarkable webpage!.